Governor-elect Arnold Schwarzenegger is promising to get moving on California's problems. Later today, he'll discuss with reporters his plans for working with a Democrat-controlled legislature. Incomplete returns show more than 55 percent of voters called for the ouster of Democrat Gray Davis. President Bush wasted little time in contacting the GOP's newest star, phoning Schwarzenegger with congratulations. It's possible the two will meet next week, when Bush stops in California on the way to an Asian tour. The president is expected to make two fund-raising stops there next Wednesday for his re-election campaign before he heads to Tokyo, the first stop on his trip. "The president said he was proud of the race he ran, and he looked forward to working with him," White House spokesman Scott McClellan reported. One California Republican with ties to the White House said Bush and Schwarzenegger are likely to make a joint public appearance in Riverside, Calif. next Wednesday. Soon-to-be-ex Gov. Gray Davis, meanwhile, was keeping a low profile Wednesday. The Democrat is said to be hard at work preparing for the upcoming transition. Davis' aides released a statement saying he's starting work on about 250 pieces of legislation still before him. California's lieutenant governor and other Democrats have pledged to put partisanship behind them -- and get to work with the new Republican governor. Schwarzenegger, a moderate Republican with tons of charisma but virtually no political experience, was easily elected among candidates to replace Davis just two months after shocking even his closest aides when he declared his candidacy on "The Tonight Show With Jay Leno." The action hero may find that the hardest part is yet to come. He will need to quickly assemble an administration and work with a Democrat-controlled Legislature to close a projected $8 billion shortfall for next fiscal year. Schwarzenegger scheduled an afternoon press conference Wednesday to discuss the transition. 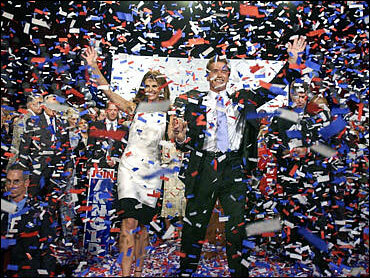 "We have tough choices ahead," Schwarzenegger said in declaring victory. "The first choice that we must make is the one that will determine our success. Shall we rebuild our state together or shall we fight amongst ourselves, create even deeper divisions and fail the people of California? Well, let me tell you something — the answer is clear. For the people to win, politics as usual must lose." With 99.2 percent of precincts reporting Wednesday, the recall was favored by 4,273,259 voters, or 55 percent, and opposed by 3,507,933 voters, or 45 percent. Among the replacement candidates, Schwarzenegger was ahead with 3,624,154 votes, or 48.3 percent of the vote; Democratic Lt. Gov. Cruz Bustamante had 2,400,264 votes, or 32 percent; Republican state Sen. Tom McClintock had 996,968 votes, or 13.3 percent; and Green Party candidate Peter Camejo had 209,189 votes, or 2.8 percent. Maria Shriver will huddle soon with NBC News executives to decide how her job as a correspondent will change now that she's about to become California's first lady. Shriver, who works primarily for "Dateline NBC," was on an unpaid leave of absence during the campaign, where she stumped with husband Arnold Schwarzenegger and defended him against allegations that he had groped other women. "She's not going to report on California politics nor anything that a Governor Schwarzenegger might have to make a ruling on," NBC News President Neal Shapiro said Wednesday. Re-elected last year with less than 50 percent of the vote, Davis fell victim to a groundswell of grumbling in a state that has struggled with its perilous financial condition. Barring a legal challenge, Schwarzenegger will be sworn in no later than Nov. 16 to serve out the remaining three years of Davis' term. First the vote must be certified, a process that can take more than a month. Schwarzenegger, 56, weathered last-minute allegations from 16 women who said he groped them or made unwanted sexual advances, and accusations that as a young man he spoke admiringly of Adolf Hitler. The former Mr. Universe inherits a state with a projected $8 billion deficit going into next year. Officials only closed a massive $38 billion deficit this year by borrowing billions. Fiscal troubles lowered bond ratings, making that borrowing more expensive. If he intends to fix state finances, Schwarzenegger only has a truncated term to do it: He would face voters again in November 2006. He scheduled an afternoon press conference Wednesday to discuss the transition. Schwarzenegger will need to turn in a budget plan by Jan. 10, giving him just a few months to deliver on campaign-trail promises not to raise taxes or cut education spending, which consumes roughly 40 percent of California's budget. Throughout the campaign, Schwarzenegger refused to say what he would cut and promised to repeal this year's tripling of the state vehicle license fee, although he has not said how he would make up the $4 billion that would cost. Schwarzenegger must work with Democrats, who are a majority of both houses in the Legislature and hold all statewide offices except his newly won governorship. Despite the rancorous recall, Bustamante and other Democrats quickly pledged to put partisanship behind them and work with the new governor. "As I see it, we campaign as partisans but we govern as Californians," said Bustamante, whose term expires in 2006. "I know how to balance a budget and I'm ready to roll up my sleeves and get to work." For Democrats, Tuesday's vote gave reason to worry. Despite having a 1.29 million-voter edge in registration and bringing in Democratic stars like former President Clinton during the campaign, Bustamante was beaten by almost a two-to-one margin. While Bustamante took 32 percent, some 61 percent of voters chose a Republican — Schwarzenegger, McClintock or Peter Ueberroth, who quit the race but remained on the ballot. In a state where Democrats have won in the last three presidential elections, the Republicans gained 2.1 million more votes than Bustamante. Exit polling showed that many Hispanics and union members — two key groups in Davis' past electoral successes — deserted him. The Democrats' troubles may bolster President Bush's hopes of winning California — and its prized 54 electoral votes — next year. Even if the president does not win the Golden State, by running a solid campaign there he can force the Democrats to spend time and money defending friendly turf rather than in a battleground state. But by taking the reins now, Schwarzenegger and the Republican could get the blame if budget troubles persist or worsen, which would hurt the president's 2004 hopes. During the brief recall campaign, the White House expressed cautious support for Schwarzenegger but kept its distance. Tuesday's results could be a warning shot to both parties, former White House chief of staff Leon Panetta said. "It's a revolt of people who are increasingly angry at the crises that face them, and at the failure of leadership," Panetta said. "If I were a Republican, I wouldn't get too cocky about what happened."